Key words: Antioxidant capacity, food supplement, Moringa oleifera, phenolics. El objetivo de esta investigación fue evaluar el efecto del solvente de extracción en el contenido de compuestos fenólicos (fenoles totales, flavonoides totales) y los niveles de capacidad antioxidante (DPPH, ABTS y FRAP) de un suplemento comercial de hojas de Moringa oleifera. El contenido de fenoles totales, flavonoides totales, no-flavonoides totales oscilaron de 55.98 a 226.20 mg ChlAE/g, de 17.63 a 23.46 mg CatE/g y de 38.34 a 202.73 mg/g, respectivamente, mientras que no fue detectada la presencia de taninos condensados en ninguno de los extractos. Los compuestos fenólicos noflavonoides fueron el grupo más abundante de compuestos fenólicos en todos los extractos y oscilaron de 68 a 90% del total de los fenoles totales. Los niveles de capacidad oscilaron de 22.43 a 124.93, de 101.03 a 245.25 y de 77.06 a 214.17 μmolTE/g en ABTS, DPPH y FRAP, respectivamente. Además, los extractos con EtOH 50% y EtOH 100% mostraron el contenido más alto y más bajo de fenólicos y niveles de capacidad antioxidante, respectivamente. Finalmente, los datos obtenidos en el contenido de compuestos fenólicos y los niveles de capacidad antioxidante del presente estudio son más altos que la mayoría de los datos reportados previamente en literatura por otros autores. Universidad Autónoma de Nuevo León, Facultad de Salud Pública y Nutrición, Facultad de Agronomía, Monterrey, Nuevo León, México. Moringa oleifera is a plant native from the sub-Himalayan regions and is now distributed in many regions of the world and is used as food and medicinal purposes. Medicinal properties are attributed almost all parts of the plant including root, bark, leaf, pod, flower and seed (1). Moringa oleifera is widely cultivated in different zones of Mexico, it is found in more than ten states of the country and it has gained attention of Mexican market because of its pharmaceutical properties (2). The antioxidant properties of Moringa oleifera leaves have been attributed to their content of phenolic compounds, which are able to decrease damage in tissues by free radical scavenging mechanism and thus several health benefits is related with its consume (3). The yield of phenolic compounds extraction is determined mainly by the extraction solvent, extraction time and temperature. The solubility of phenolics is governed by the chemical nature of the plant sample, as well as the polarity of the extraction solvent used. Solvents such as methanol and ethanol with different proportions of water have been used for the extraction of phenolics from plant materials because of they are found to be the most efficient solvents (4). The aim of this work was to evaluate the effect of extraction solvent on the phenolics content and antioxidant capacity levels of a commercial food supplement from Moringa oleifera leaves. Commercial food supplement capsules product from Moringa oleifera leaves were kindly provided by PhD Emilio Olivares-Saenz, who produce and market the product in the Protected Agriculture Center of the Autonomous University of Nuevo León. Samples were taken out from capsules and sieved trough 500 µm sieve (mesh 35). The methods of Association of Official Analytical Chemists (AOAC) (5) were used to determine moisture (method 925.09), protein (N x 6.25) (method 960.52), ash (method 923.03), fat (method 923.03) and crude fiber (920.86). Results were expressed in terms of percentage (g/100g). The total carbohydrates content was obtained by difference as follows: total carbohydrates = 100 − (g of water + g of protein + g of ash + g of fat + g of crude fiber). Three hundred milligrams of samples were mixed with 30 mL of solvent for 2 h at 200 rpm at room temperature. After that, samples were centrifuged at 2600 g, supernatants collected, protected from light and stored at -20°C until they were used for phenolics and antioxidant capacity analysis. Extraction solvents were methanol (MeOH) and ethanol (EtOH) at 100%, 80% aqueous and 50% aqueous. Phenolics and antioxidant capacity assays were carried out according to López-Contreras et al. (6). The total phenols, total flavonoids and condensed tannins contents were evaluated by FolinCiocalteu, aluminum chloride and vanillin-HCl methods. Results were expressed as milligrams of chlorogenic acid per gram of sample for total phenols (mg ChlAE/g) and milligrams of catechin equivalents per gram of sample (mg CatE/g) for total flavonoids and condensed tannins. 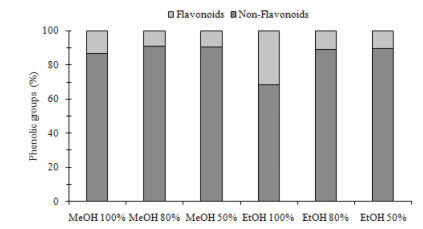 In addition, percentage of flavonoids (Fla) and nonflavonoids (Non-Fla) compounds were calculated as follows: %Fla=((total flavonoids*100)/total phenols), %Non-Fla=(100-%Fla). All of the results were expressed as mean values of three samples ± standard deviation. Statistical significance among samples was evaluated by analysis of variance (ANOVA) followed by Tukey’s test using Minitab 14.0 (7). A level of probability of p<0.05(5%) was set as statistical significance. Results were expressed as mean values of three samples ± standard deviation. There were significant differences in the phenolics analysis (p<0.05), EtOH50% and EtOH 100% obtained the highest and lowest content in total phenols, total flavonoids and total non-flavonoids respectively. EtOH 50% was 4.0 and 1.3 and 5.2 fold-higher than EtOH 100% in total phenols, total flavonoids and total non-flavonoids, respectively. The levels obtained for total phenols, total flavonoids and total non-flavonoids ranged from 55.98 to 226.20 mg ChlAE/g, 17.63 to 23.46 mgCatE/g and from 38.34 to 202.73 mg/g, respectively, while condensed tannins were not detected in none of the samples (Figure 1). FIGURE 1. Influence of extraction solvent on phenolic content of a commercial food supplement from Moringa oleifera leaves. Different letters within the same evaluation are significantly different (p<0.05). 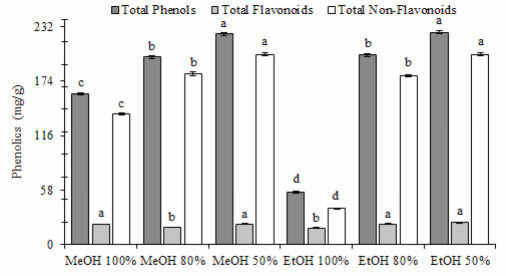 Non-flavonoids compounds were the most abundant group of phenolics in all the extracts showing MeOH 80%, MeOH 50%, EtOH 80% and EtOH 50% values around 90% of non-flavonoids in their phenolic composition, followed by MeOH 100% with 86% and the lowest value was shown by EtOH 100% with 68% on non-flavonoids compounds (Figure 2). FIGURE 2. Influence of extraction solvent on phenolic composition of a commercial food supplement from Moringa oleifera leaves. Also, significant differences (p<0.05) between samples were observed in DPPH, ABTS and FRAP antioxidant capacity assays. Same pattern observed in phenolics was obtained in antioxidant capacity, being EtOH 50% and EtOH 100% the extracts that showed highest and lowest levels of antioxidant capacity. Results of antioxidant capacity were from 22.43 to 124.93, from 101.03 to 245.25 and from 77.06 to 214.17 μmolTE/g in ABTS, DPPH and FRAP, respectively. EtOH 50% was 5.5, 2.4, and 2.7 fold-higher than EtOH 100% in ABTS, DPPH and FRAP, respectively (Figure 3). FIGURE 3. Influence of extraction solvent on antioxidant capacity of a commercial food supplement from Moringa oleifera leaves. Different letters within the same evaluation are significantly different (p<0.05). Moringa oleifera leaves are considered a high source of protein with high content of essential amino acids such as methionine, cystine, tryptophan and lysine, but also a good source of minerals (1). The protein content of the commercial food supplement from Moringa oleifera leaves of our study is higher than the content reported previously by Valdez-Solana et al. (2), who found 10.74% and 11.48% in Moringa oleifera leaf powder from two Mexican cultivars, but is in the range of the data reported by Makkar and Becker (8) and Aye and Adegun (9) who found 25.1% and 22.2% of protein content, respectively. On the other hand, our results are very close to the findings reported by Moyo et al. (10) in fat and ash with 6.50% and 7.64%, respectively. Contrary to protein, the content of crude fiber of our study is lower than all the data obtained by authors mentioned before since they reported data ranging from 7 to 30%. The results in the content of phenolics and antioxidant capacity of commercial food supplement from Moringa oleifera leaves, showed that an increasing in the polarity of the solvent leads to an increasing in the content of phenolics compounds and thus in the antioxidant capacity level. This behavior was previously described by Turkmen et al. 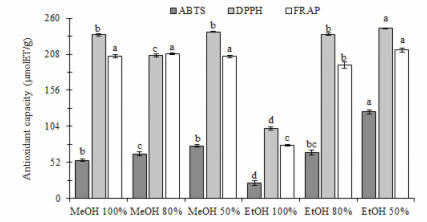 (11) who extracted bioactive compounds from black tea (Camellia sinensis L.) and black mate tea (Ilex paraguariensis) using the same ethanol and methanol solvent mixtures and reporting EtOH 50% and EtOH 100% as the solvents with the highest and lowest content of phenolics content and antioxidant capacity level, which is similar to our observations. Several studies have evaluated the phenolic content of leaves from Moringa oleifera. For instance, Vongsak et al. (12) obtained bioactive compounds using maceration at 1:20 (w/v) ratio sample respecting solvent by using 70% aqueous ethanol finding 377.8 and 82.9 mg/g in total phenols and total flavonoids, respectively, which is higher than our results. Singh et al. (13), obtained an aqueous phenolic extract by stirring sample for 2 h at 80°C and they found 105 and 31.28 mg/g of total phenols and total flavonoids, respectively, being their results in phenolics lower than most of our data, but higher in flavonoids. In addition, although they did not calculate the percentage of non-flavonoids and flavonoids compounds, we applied our formulas to their data, obtaining 55-79% and 70% of non-flavonoids for Vongsak et al. (12) and Singh et al. (13), respectively, which is in the range of our observations. In addition, our observation in condensed tannins are in agreement with Bennet et al. (14) since they did not detect the presence of condensed tannins in Moringa oleifera leaves, but are contrary to data reported by Sriwichai et al. (15) who obtained 0.77 mg/g of this phenolic group in this plant material. The Antioxidant capacity has been also evaluated in phenolic extracts from Moringa oleifera leaves. In this regard, Surveswaran et al. (16), extracted phenolics by 80% methanol overnight at room temperature with occasional shaking and they obtained antioxidant capacity levels of 7.4, 4.7 and 0.17 μmolTE/g in ABTS, DPPH and FRAP assays, respectively, being these results lower than our data. Kunyanga et al. (17), extracted phenolics by sequential ultrasonic extractions with acidifiedmethanol, and aqueous methanol, purified extracts with polyvinylpolypyrrolidone, freeze-dried and finally extract was dissolved in water-ethanol-formic acid solution and they reported 186 micromoles of Iron Equivalents per gram of sample (μmolFeE/g) in FRAP assay. Jaiswal et al. (18), obtained an aqueous extract at 40-60°C for 48 h and they reported 85 μmolFeE/g in FRAP assay. The results obtained by these two authors are also lower than our data. On the other hand, Pari et al. (19) obtained extracts by soaking sample in methanol overnight and obtained 636 μmolTE/g in ABTS, which is higher than our results. Based on results obtained in the present study, we concluded that: EtOH 50% is the best solvent to obtained phenolics with the higher antioxidant capacity in the commercial food supplement from Moringa oleifera leaves. Independently of the solvent, non-flavonoids is the main group of phenolics present in the methanolic and ethanolic extracts of a commercially food supplement from Moringa oleifera. In addition, data obtained in phenolics and antioxidant capacity of the present study are in most of the cases higher than data of scientific literature reported previously by other authors and thus the commercial food supplement used in the present work could be considered a nutraceutical product, although studies on the phenolics bioavailability are recommended. Authors would like to acknowledge the funding provided to Cuerpo Académico Tecnología e Innovación Agroalimentaria through Apoyo al Fortalecimiento de Cuerpos Académicos PRODEP 2015 and also to Jahir Ruiz-Bautista, Raúl Flores-Alonso and Isac Montiel-Ramos for be part of the research as undergraduate students of the Food Industry Engineer Program. Anwar F, Latif S, Ashraf M, Hassam GA. Moringa oleifera: a food plant with multiple medicinal uses. Phytother. Res. 2007; 21(1), 17-25. Valdez-Solana MA, Mejía-García VY, TéllezValencia A, García-Arenas G, Salas-Pacheco J, Alba-Romero JJ, Sierra-Campos E. Nutritional content and elemental and phytochemical analyses of Moringa oleifera grown in Mexico. J. Chem. 2015; Vol. 2015, Article ID 860381, 9 pages. Razis AFA, Ibrahim MD, Kntayya SB. Health benefits of Moringa oleifera. Asian Pac. J. Cancer Prev. 2014; 15(20), 8571-8576. Dai J, Mumper RJ. Plant phenolics: extraction, analysis and their antioxidant and anticancer properties. Molecules. 2010; 15(10), 7313-7352. Official Methods of Analysis. Association of Official Analytical Chemist International (AOAC). 1998; 16th Edition, 4th Revision. AOAC International Maryland, USA. López-Contreras JJ, Zavala-García F, Urías-Orona V, Martínez-Ávila GCG, Rojas R, Niño-Medina G. Chromatic, phenolic and antioxidant properties of Sorghum bicolor genotypes. Not. Bot. Horti Agrobo. Cluj-Na. 2015; 43(2), 366-370. Minitab 14 statistical software. Computer software. State College, PA: Minitab Inc. 2004; www.minitab.com. Makkar HPS, Becker K. Nutritional value and antinutritional components of whole and ethanol extracted Moringa oleifera leaves. Anim. Feed Sci. Technol. 1996; 63(1-4), 211-228. Aye PA, Adegun MK. Chemical Composition and some functional properties of Moringa, Leucaena and Gliricidia leaf meals. Agric. Biol. J. N. Am. 2013; 4(1), 71-77. Moyo B, Masika PJ, Hugo A, Muchenje V. Nutritional characterization of moringa (Moringa oleifera Lam.) leaves. Afr. J. Biotechnol. 2011; 10(60), 12925-12933. Turkmen N, Sari F, Velioglu YS. Effects of extraction solvents on concentration and antioxidant activity of black and black mate tea polyphenols determined by ferrous tartrate and Folin–Ciocalteu methods. Food Chem. 2006; 99(4), 835-841. Vongsak B, Sithisarn P, Mangmool S, Thongpraditchote S, Wongkrajang Y, Gritsanapan W. Maximizing total phenolics, total flavonoids contents and antioxidant activity of Moringa oleifera leaf extract by the appropriate extraction method. Ind. Crops Prod. 2013; 44, 566-571. Singh BN,Singh BR, Singh RL, Prakash D, Dhakarey R, Upadhyay G, Singh HB. Oxidative DNA damage protective activity, antioxidant activity and anti-quorum sensing potential of Moringa oleifera. Food Chem. Toxicol. 2009; 47(6), 1109-1116. Bennet RN, Mellon FA, Foidl N, Pratt JH, Dupont MS, Perkins L, Kroon PA. Profiling glucosinolates and phenolics in vegetative and reproductive tissues of the multi-purpose trees Moringa oleifera L. (horseradish tree) and Moringa stenopetala L. J. Agric. Food Chem. 2003; 51(12), 3546-3553. Sriwichai W, Berger J, Picq C, Avallone S. Determining factors of lipophilic micronutrient bioaccessibility in several leafy vegetables. J. Agric. Food Chem. 2016; 64(8), 1695-1701. Surveswaran S, Cai YZ, Corke H, Sun, M. Systematic evaluation of natural phenolic antioxidants from 133 Indian medicinal plants. Food Chem. 2007; 102(3), 938-953. Kunyanga CN, Imungi JK, Okoth MW, Biesalski HK, Vadivel V. Total phenolic content, antioxidant and antidiabetic properties of methanolic extract of raw and traditionally processed Kenyan indigenous food ingredients. LWT-Food Sci. Technol. 2012; 45(2), 269-276. Jaiswal D, Rai PK, Mehta S, Chatterj S, Shukla S, Rai DK, Sharma G, Sharma B, Khair S, Watal G. Role of Moringa oleifera in regulation of diabetes-induced oxidative stress. Asian Pac. J. Trop. Med. 2013; 6(6), 426-432. Pari L, Karamać M, Kosińska A, Rybarczyk A, Amarowicz R. Antioxidant activity of the crude extracts of drumstick tree (Moringa oleifera Lam.) and sweet broomweed (Scopariadulcis L.) leaves. Pol. J. Food Nutr. Sci. 2007; 57(2), 203-208.